As part of Ashland's Wildfire Safety Ordinance (AMC18.3.10.100), adopted ordinance amendments include modifications to Ashland Land Use Ordinance Chapter 18.4.4 Landscaping, Lighting, and Screening; specifically affecting 18.4.4.060 Fences and Walls. 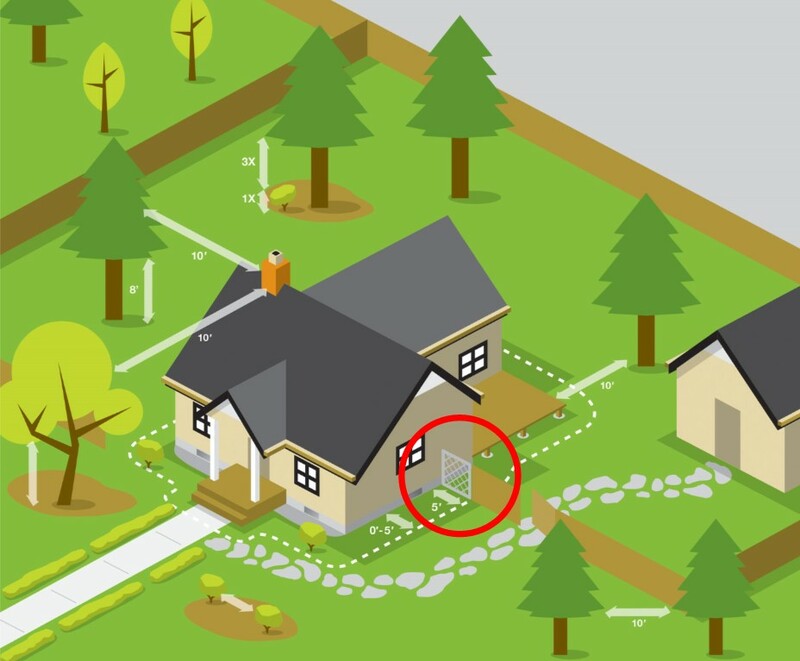 Under the newly adopted ordinance, AMC18.4.4.060.B.8 States that any fencing attached to a building or deck within the Wildfire Lands Overlay shall be made of noncombustible materials within five feet of the connection to the structure. As of October 18, 2018 Ashland's Wildfire Safety Ordinance includes all property within the City of Ashland under the Wildfire Lands Overlay. Included on this page is the portion of 18.4.4 that pertains to fences and the Wildfire Safety Ordinance. Refer to Ashland Municipal Code for complete requirements in regards to your project. A. Permitting. Permits, granted through Ministerial review, are required prior to installing any permanent fence or wall to ensure compliance with City standards. The property owner should obtain a property boundary survey where property boundaries are not otherwise identified. Where a development is subject to land use approval, the City may require installation of screening walls or fences as a condition of approval for development, as provided by other ordinance sections. A building permit may be required for some fences and walls, pursuant to applicable building codes. 8. Wildfire Lands Overlay. Fencing attached to a building or deck within the Wildfire Lands Overlay shall be made of noncombustible materials within five feet of the connection to the structure. a. A fence with wood framing and steel mesh or other noncombustible infill panels shall be considered to comply with this section. b. A metal gate, a minimum of three feet in width, that is installed within a wood-framed fence immediately adjacent to a building or deck shall be considered to comply with this section. c. Existing wood fences that are to be retrofitted to attach to a new building, addition, or deck, subject to the General Fuel Modification Area standards per subsection 18.3.10.100.B, shall be retrofitted so the fence ends with a noncombustible material like masonry or metal to keep fire from spreading to the building or deck. d. Combustible fencing materials may be permitted within five feet of a building or deck when the Staff Advisor, in consultation with the Fire Code Official, has determined the portion of the structure adjoining the combustible material is constructed with ignition-resistant building materials sufficient to reduce the spread of fire from the combustible fencing materials.